We all have our favorite places on Earth, and I suppose some of us have our favorite places on Mars--but I haven't been there. Yet. I go to Alsace at least once a year. For wine. But also for the quaint fairy-tale atmosphere in the dozens of tiny villages still very much as they were hundreds of years ago. World War II left few scars on these towns, so the old-fashioned beauty of the Fachwerk houses has been preserved remarkably well. I suppose it's my love for the fairy tale that keeps me coming back. And the wine of course. Alsatian wines are so misunderstood. 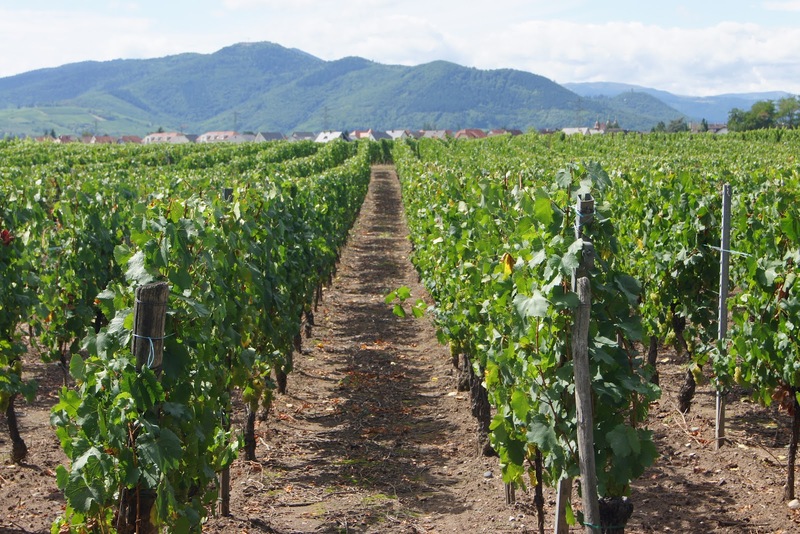 When you think of wine from this region, you might think of Riesling. You might think only of Riesling, and this would be sad. What about Pinot Gris? And Sylvaner? And Muscat? 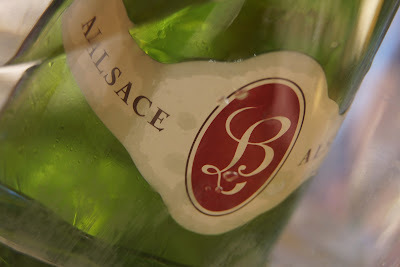 And my favorite varietal from Alsace Gewurztraminer? 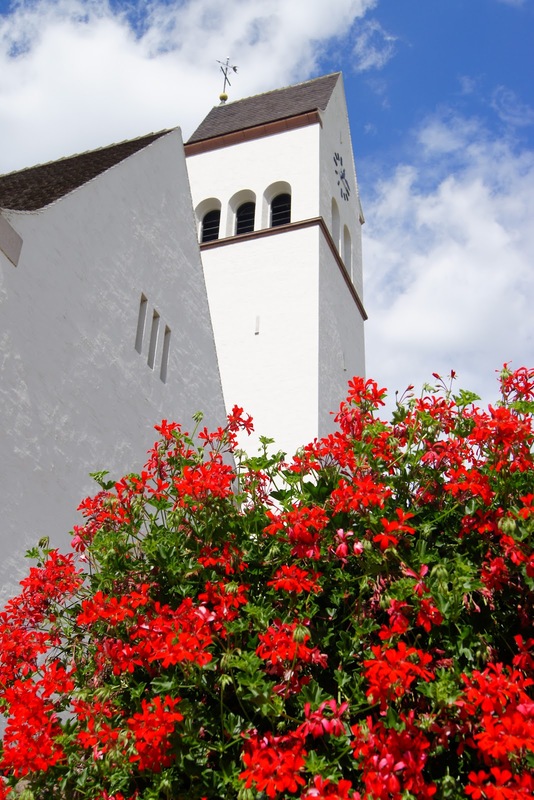 Alsatian wines are part of a culture that appreciates great traditional food and the atmosphere of quaint restaurants. On our last trip to Alsace we finally went cycling through the vineyards. I'd wanted to do this for years. We were staying just outside Colmar in an Ibis hotel. With Ibis, you know what you're getting. It's completely characterless--sort of like the McDonald's of European hotels--but at least there are few bad surprises. I think as long as a hotel has an acceptable bed, I'm set. I'm not going to spend all day in this place. We spent three days cycling from one town to the next--on the worst bicycles (velos in French) I've ever rented. Truly. Awful. Bad. One of us had a flat and had to walk back to Colmar (the flat repair kit was useless: wrong pump, dried up glue). Fortunately, we were all having such a wonderful time we were able to take little mishaps in our stride. The best part about our bike ride through the vineyards--shhhhhh, come here--was that I finally tasted the Gewurztraminer grape right from the vine. Yes, this is technically stealing, but I don't think anyone will miss the four grapes I ate. And this post is like an homage to the grape, right? I'd like to think it is. 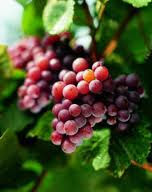 Although Gewurztraminer is a white wine, the grape is actually red. And surprise, surprise: it tastes like Gewurztraminer. Yum. The end of August is definitely the best time to visit Alsace. 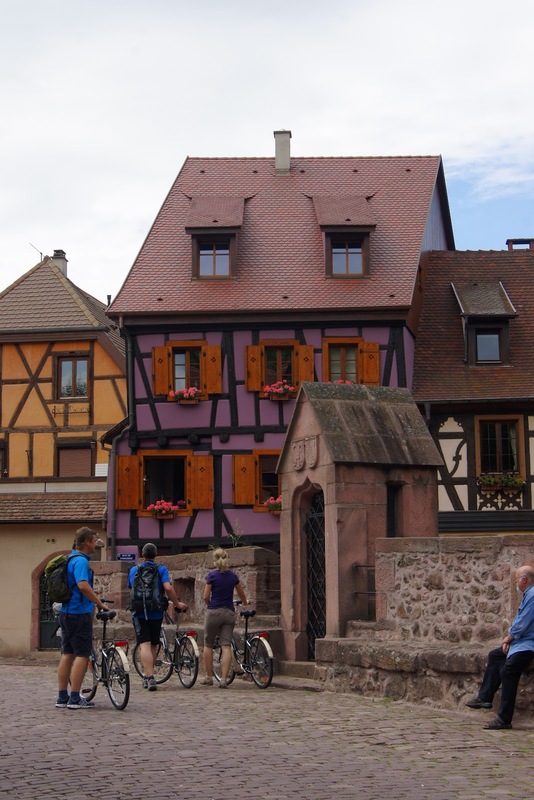 Alsace is sort of hard to get to if you're coming from the US, and that's why when you walk through the towns of Riquewihr, Ribeauvillé and Kaysersberg you'll hear very few American accents. It's worth the slog, though, if you can combine a visit to the region with a trip to Germany or a trip to other destinations in France or Belgium. Alsace is just across the German/French border or the French/Swiss border, so flying into Frankfurt of Basel would be the quickest way to get there. You could also fly into Strassbourg, but this looks more expensive and more complicated than Frankfurt or Basel. Here are a few of my favorite pictures of Alsace. I have thousands. 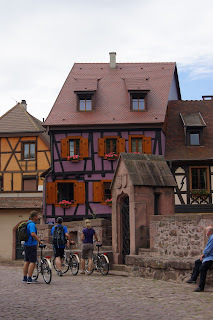 The village of Eguisheim, about 15 minutes from Colmar. Eguisheim is a circular Roman village famous for being the birthplace of Pope Leon IX. Eguisheim. Alsace is known for its flowers in the spring and summer. What are your favorite places on earth? The place you'd always return to? The place that makes you feel at home? Contest! Contest! Contest! Read through I Must Be Off! from A to Z and win a copy of Dorothee Lang and Smitha Murthy's book Worlds Apart! Be one of the first three to read and comment on 26 posts, and you'll get this book. To continue with the I Must Be Off! A-Z, go to B is for Bali. Some of my favorite places on earth involve vineyards and wine, too -- most notably, Sonoma County, California! However, I just tasted grapes right off the vine in Catalonia last month. Very nice. I'll put Alsace on my list now. Maybe I'll steal a Gewurztraminer grape or four, too. Beautiful! 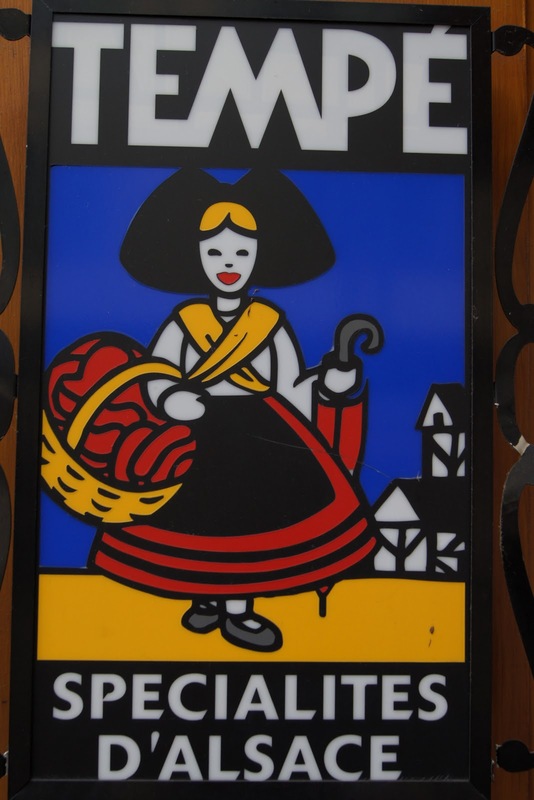 Was in Alsace/Elsaß around 15 or 20 years ago. 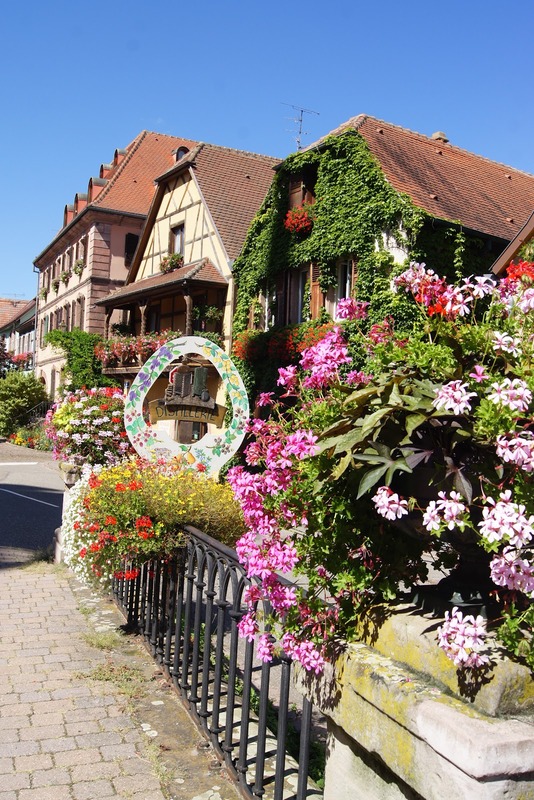 Colmar and Eguisheim...just loved them, especially the architecture and the roses and geraniums that seemed to decorate the front of every building. And of course the vineyards and wine tastings. Like you, I have thousands of photos. Such a photogenic place! Yes! You've pegged Alsace perfectly. All these things, especially the wine tastings. So much fun.